If you've fallen in love with this collection, you're in luck. It is currently on sale at Beyond Skin's online store. 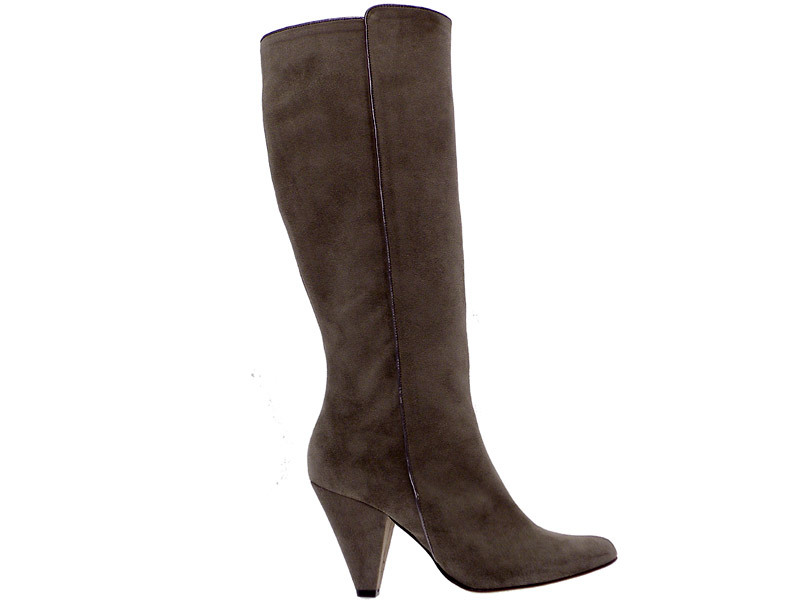 The line offers boots and shoes for every occasion, in gorgeous hues of black, gray, scarlet, and plum. And yes, international shipping is available. Beyond Skin creates its faux-suede footwear using a microfiber called Dinamica, which is made in Italy from 100 percent recycled PET, including post-consumer waste such as plastic bottles. Although Dinamica has found applications in the furniture and automotive industries, Beyond Skin is the first footwear label to get its foot in the door, so to speak. Compared with petroleum-based polyester, Dinamica cuts carbon emissions by 60 percent. Compared with petroleum-based polyester, Dinamica cuts carbon emissions by 60 percent. And because the material is super-durable and water-repellent, the shoes are capable of surviving both adverse weather (rain, snow) and careless drink-spillers. Despite its hardy qualities, Dinamica is pliable and soft to the touch—a true eco-fashion innovation. Beyond Skin doesn’t use polyvinyl chloride (PVC) in its collections, opting for breathable and antibacterial polyurethane for its faux-leather effects and linings. The soles of the shoes are made from a partly recycled rubber resin. Wouldn’t it be amazing if the label could meet our eco-handbag needs, too? You heard it from us, first: Beyond Skin will be launching a capsule range of accessories for spring. Need vegan shoes/boots,etc. without rubber or carbamix. Any help? Despite Beyond Skin's eschewal of anything animal-derived, its customers aren't missing a thing. The collection of boots, high- and mid-heel pumps, ballet flats, and cage sandals are just as bold and of-the-moment as the alternatives on the market. Whittle and Dean want a sustainable alternative to animal-based leather and suede for good reason. "A whopping 25 percent of the world's surface is used for rearing cattle," Whittle tells Ecouterre, citing statistics from the Food & Agriculture Organization of the United Nations. Livestock and feed-crop agriculture in the U.S., she adds, account for 47 percent of pesticide use, 50 percent of antibiotics, and one-third of the nitrogen and phosphorous loads that contaminate freshwater. Heather Whittle, a stylist, and former makeup artist Natalie Dean founded Beyond Skin in 2001 when they had trouble finding stylish yet animal-free shoes. Like many ethical-fashion pioneers, the duo have struggled over the past 10 years to find the right mix of materials, production methods, and aesthetics. Their determination has paid off, however, resulting in a number of accolades, including the Drapers Award, the Grazia Ethical Fashion Entrepreneur Award, and the RSPCA Good Business Award. Soft, breathable, and pill-resistant, Dinamica is said to be "100 percent ecological." Miko uses a nontoxic, water-based process, developed by Japanese corporation Asahi Kasei, which is as kind to the environment as it is to human health—perfect, then, for a cruelty-free footwear label. In a single year, Italian manufacturer Miko produces approximately 600,000 meters (656,000 yards) of Dinamica, or the surface-area equivalent of 88 regular football fields. Miko recycles 1.5 million plastic bottles to create the fiber, a number that makes up only 0.05 percent of the annual total generated in the United States. Beyond Skin has been making vegan shoes for over 10 years, but it's stepping up the eco-stakes this season with a faux suede derived from recycled plastic bottles. Known as Dinamica, the microfiber looks and feels like the genuine article, except it's cruelty-free, uses no solvents or harsh chemicals, and is completely recyclable at the product's end of life.